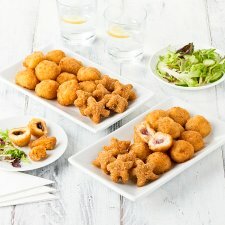 A selection of 36 breaded cheese bites including 12 mature Cheddar, full fat soft cheese and pickle bites, 12 brie and cranberry bites and 12 mascarpone, Cheddar and japaleno stars. 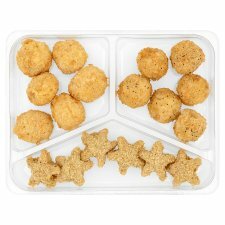 A selection of 36 breaded cheese bites including 12 Cheddar and pickle bites, 12 brie and cranberry bites and 12 spicy cheese stars. Instructions: Place product on a baking tray in the centre of a pre-heated oven for 10 minutes. Suitable for home freezing. Ideally freeze as soon as possible after purchase but always by 'use by' date shown. Once defrosted, do not refreeze.This product may have been previously frozen and has been restored to chill temperature under carefully controlled conditions. It is still suitable for home freezing. Cheddar and full fat soft cheese with a smooth pickle centre, encased in a crispy breadcrumb. Mature Cheddar Cheese (Milk) (28%), Full Fat Soft Cheese (Milk), Smooth Pickle (22%), Wheat Flour (Wheat Flour, Calcium Carbonate, Iron, Niacin, Thiamin), Rapeseed Oil, Dried Potato, Potato Starch, Water, Wheat Starch, Salt, Stabilisers (Methyl Cellulose, Xanthan Gum), Olive Oil, Yeast, Raising Agents (Disodium Diphosphate, Sodium Bicarbonate), Flavouring. Smooth Pickle contains: Sugar, Malt Vinegar (Barley), Courgette, Swede, Onion, Carrot, Water, Cane Molasses, Cornflour, Spirit Vinegar, Salt, Barley Malt Extract, Lemon Juice, Coriander Seed, Ginger Powder, Cinnamon, Clove Powder, Black Pepper, Cayenne Pepper. Brie and full fat soft cheese around a cranberry chutney sauce centre, covered in a paprika breadcrumb and fried. Brie Full Fat Soft Cheese (Milk) (32%), Wheat Flour (Wheat Flour, Calcium Carbonate, Iron, Niacin, Thiamin), Full Fat Soft Cheese (Milk), Rapeseed Oil, Sugar, Water, Potato Starch, Cranberry (3.5%), Red Onion, Dried Potato, Red Wine Vinegar, Cornflour, Red Wine, Orange Juice from Concentrate, Concentrated Cranberry Juice, Poppy Seeds, Salt, Wheat Starch, Stabilisers (Methyl Cellulose, Xanthan Gum), Gelling Agent (Pectin), Raising Agents (Disodium Diphosphate, Sodium Bicarbonate), Flavouring, Black Pepper, Yeast. Mascarpone cheese and mature Cheddar cheese with jalapeno chillies, coated in breadcrumbs and fried. Mascarpone Full Fat Soft Cheese (Milk) (26%), Mature Cheddar Cheese (Milk) (24%), Wheat Flour (Wheat Flour, Calcium Carbonate, Iron, Niacin, Thiamin), Rapeseed Oil, Potato Starch, Water, Jalapeño Chilli (2%), Red Chilli, Wheat Starch, Sugar, Lemon Juice from Concentrate, Salt, Modified Maize Starch, Garlic Powder, Parsley, Onion Powder, Tomato Powder, Sunflower Oil, Extra Virgin Olive Oil, Stabiliser (Methyl Cellulose), Cumin Powder, Paprika, Black Pepper, Chilli Powder, Black Pepper Extract, Yeast.